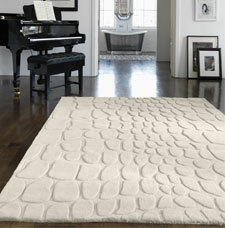 Croc is a range of super heavyweight hand-tufted 100% modern wool rugs. The rugs feature a thick and dense wool pile, which feels luxurious underfoot. With a design inspired by pebbles/stones in a stream, the rugs feature a high-low pile design element whereby the pile has a minimum of two heights for an extra dimension.